A supermarket chain will open its first "people-powered" store this week using technology that captures energy from vehicles to power its checkouts. In a European first, Sainsbury's will install the invention at its new store in Gloucester, opening this Wednesday. Energy will be captured every time a vehicle drives over "kinetic road plates" in the car park and then channelled back into the store. The kinetic road plates are expected to produce 30 kWh of green energy every hour — more than enough energy to power the store's checkouts. The system, pioneered for Sainsbury's by Peter Hughes of Highway Energy Systems, does not affect the car or fuel efficiency, and drivers feel no disturbance as they drive over the plates. 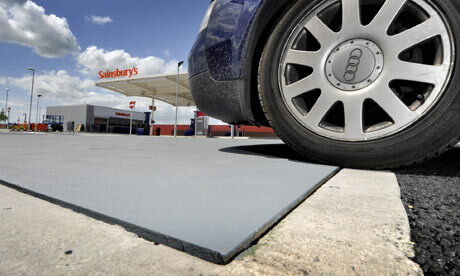 Alison Austin, Sainsbury's environment manager, said: "This is revolutionary. Not only are we the first to use such cutting-edge technology with our shoppers, but customers can now play a very active role in helping make their local shop greener, without extra effort or cost. "We want to continue offering great value but we also want to make the weekly shop sustainable. Using amazing technology like this helps us reduce our use of carbon and makes Sainsbury's a leading energy-efficient business." The kinetic road plates are one of a number of energy-saving measures at Sainsbury's new store in Gloucester Quays, Gloucester. The store will harvest rainwater to flush the store's toilets and solar thermal panels will heat up to 100% of the store's hot water during the summer, and more than 90% of the construction waste was re-used or recycled. David Sheehan, director of store development and construction at Sainsbury's, said: "The new environmental features within the Gloucester Quays store mark a very exciting time in store development. We are able to use cutting-edge technology to improve our services and the store environment for our customers and colleagues, at the same time as ultimately reducing our carbon footprint across the UK." Scientists pointed out that the energy generated by the devices is not totally "free". Rather, they capture a tiny amount from each car that passes over them, increasing each vehicle's fuel consumption by a tiny amount.